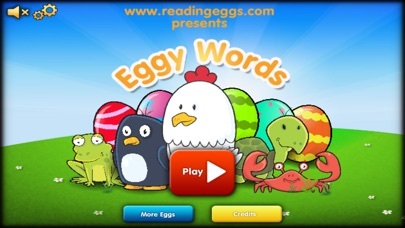 I was happy when my 5 year old took to the free version of Reading Eggs. I paid today for the full app and it won't even open. Needless to say I am out $2 and I have a disappointed kiddo. Don't waste your money. My son is 7 and likes this game, but it's not his favorite. 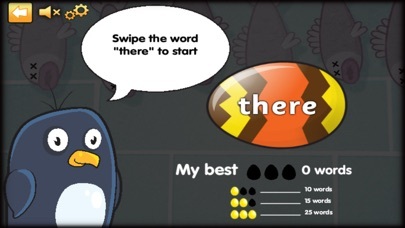 This game has the student tap the chosen word they are learning printed on colored Easter eggs that leap and fall across the screen. "Obstacles" are in the form of words the child isn't looking for, rotten eggs, frying pans, pigs, etc. If they click the wrong egg or object, they lose one "life" (a green smiley face in the upper right hand corner). They can earn extra "lives" if they click on an egg imprinted with smiley faces. As the level progresses, the eggs come faster and some are smaller. 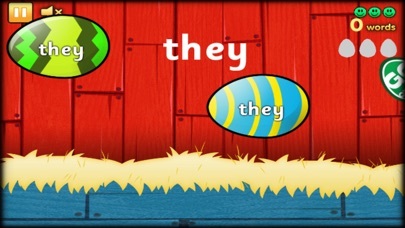 After successfully completing a level choosing the chosen word, the next level has the child spelling the same word from letters on Easter eggs delivered in the same way with the same obstacles. Letters must be chosen in the correct order, of course, and the letters are displayed after being chosen on the bottom of the screen. This helps reinforce both the reading and the spelling of the sight word. This is a great way for a child to learn to read sight words. The only downside I see is that although there are 3 different menu options for the child, they all play exactly the same game, although there are different sight words available on level one of each game. We are homeschoolers and use this company's program, Reading Eggs. 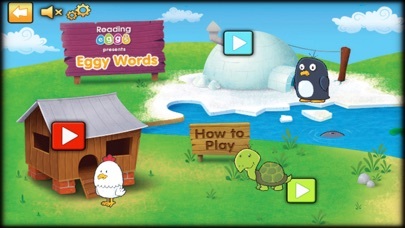 This app is a fun way to sometimes back up what he learns on Reading Eggs. App does not work want a refund!! This app doesn't load I have reinstalled it 2 times. how do I get a refund? Developer is in a foreign country so not really sure how to contact them and couldn't find an email. Won't open on iOS 7.0!! Love this app but now it won't open after I updated my phone software to iOS 7.0. It just shows a black screen. Please fix!! I don't want to reinstall it and lose all of my kids' progress. Also, have different profiles for each kid so they go at their own pace learning the words. Don't have the eggs get smaller. You can't read them because they're too small and going so fast. We love this app. My only complaint is the result of tapping the wrong words or items is so hilarious to my son that he does it on purpose just to see the effect. As the level is mastered the eggs not only move faster; they get smaller. The increased speed is challenge enough; the decreased size makes the words almost impossible to decipher. Creator should include an option to disable this feature for those of us limited to the smaller screen of a phone or iPod. I can't even see the words myself by the end of a round so imagine how frustrated my early reader is getting. Reading eggs is how my sons school does home work. Unfortunately the app doesn't allow u to log in to get the homework. I am wishing this app allowed for more than one child. It does not have an option to customize it for each child only to reset it completely. Would earn five stars if you could have multiple players with different skills and levels with saved games. My son loved the lite free version of this app so I spent $2.99 and purchased the full app. It wont download! I've tried several times and I have plenty of storage. An error message keeps appearing saying it can't load at this time!